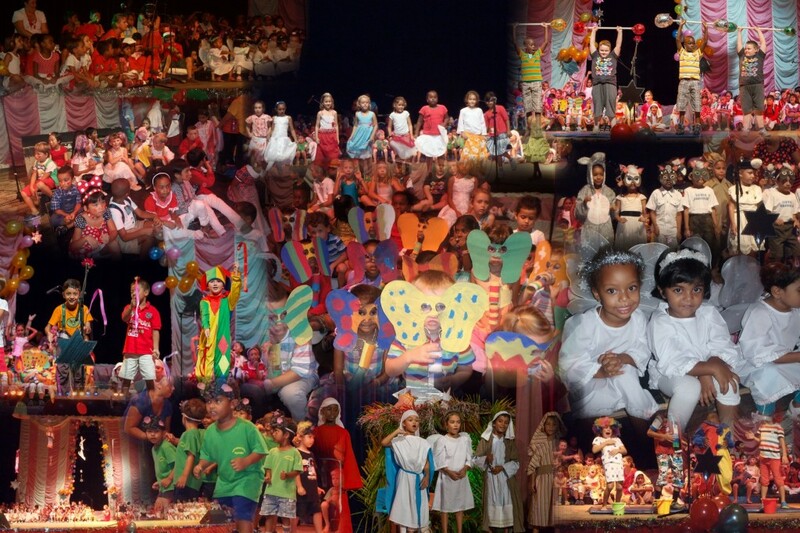 The International Conference Centre Seychelles (ICCS) was the venue for the Early Childhood Christmas Show. The eager cast performed “The Nursery Rhyme Nativity” to a packed auditorium on December 4th. The audience were treated to a visually spectacular performance of an amended nativity tale where Mary and Joseph encounter on their way to Bethlehem a travelling circus. The whole Early Childhood Section played a part and entertained everybody with lyrical Christmas songs with familiar nursery rhyme tunes. The hour long show was as enjoyable to present and perform in for the children and appeared equally enjoyed by the parents and families who had come along to watch. As producer and director of the show I am greatly indebted to everyone who assisted in the production. The EC staff for their hard work coaching their classes, preparing the masks and assisting with the art work, Amalia Herrara Grau for helping with the huge task of decorating the large stage, Lorraine for the choreography of the can can dancers, Mrs Senekal for painting the circus figures and of course the PTA for their continued support.